To mark the 60th anniversary of the Coronation of Her Majesty Queen Elizabeth II, a major exhibition will bring together a spectacular array of dress, uniform and robes worn by the principal royal party. Works of art, paintings and objects used on the day will also be on display to recreate the atmosphere of that extraordinary occasion. 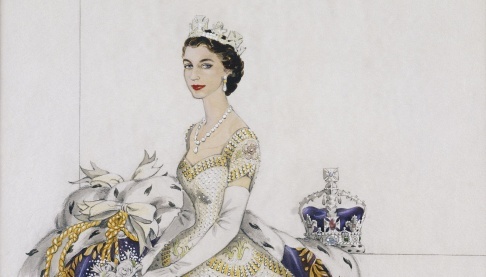 In particular, sketches by British couturier Norman Hartnell, whose design for The Queen’s Coronation Dress, considered to be his masterpiece of royal couture, is immortalized in an intricate drawing. In watercolour and bodycolour over pencil, it shows in detail the full-skirted gown with its tiers of rich embroidery terminating in a wide multi-coloured border. Something you wouldn’t want to miss if you were in London..
Visit the site for more information here.